Job's tears are planted widely in China. Its grain is wide oval or oblong oval,4-8mm long, 3-6mm wide, teardrop shape, so it's called Job's tears. The surface of the grain is white and glossy with tawny remnant peel occasionally. One end is blunt round, the other end is a little dent with light maple dot shape umbilici. The back is bulge round. The ventral side is a wide and deep ditch. Is Job's Tears and Barley the Same? Job's tears are both medicinal herb and popular food, famous by its dampness-removing feature. Job's tears help to eliminate excessive dampness inside the body and invigorate the spleen, improving metabolism. 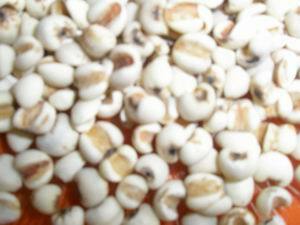 Job's tears also cure lung related chronic diseases such as empyema,cough, and asthma. Job's tears help to remove evil Qi in muscles and bones. It curesmuscular contracture, rheumatic paralysis. As the lung is related to the skin, eating Job's tears can make skin smooth and white. The lung is also related to sad emotion, so Job's tears are helpful for depression suffers. Modern medicine researchers show that Job's tear is a anti-cancer food. It has functions of immunization, reducing blood sugar and blood pressure, inducing ovulation, etc..
Who can eat Job's tears? People with pulmonary asthenia, pulmonary abscess, pus phlegm. Who cannot eat Job's tears? When served as a food, job's tears are often added in soups, congee, etc. In Southeast Asia job's tears soup is a popular drink. They are also grinded into powder and used in bread or cake; or served as brewed drinks; or used as facial mask powder. When used as a medicinal herb, stir fried Job's tears are used to remove dampness while stir fried Job's tears with wheat bran are used to invigorate spleen.